Guest contributor: Miss B and her book review of "The Book of Story Beginnings"
About a week ago, I read "The Book of Story Beginnings" by Kristen Kladstrup. 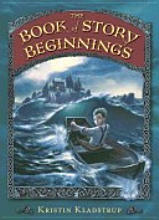 When I first glanced at the cover in the library, I thought it was going to be a book of story beginnings. But when I started reading it I found out that it was a science fiction book. The main characters were Aunt Lavonne, Lucy Martin, Oscar Martin, Shel (Lucy's dad), Jean (Lucy's mom), Aunt Helen, and Uncle Brian. Oscar wrote a story beginning in the book of story beginnings. The story came true. There was a huge ocean around his farm in Iowa. There was a rowboat sitting on the sidewalk. Oscar climbed in and rode away. His sister, Lavonne, tried to stop him, and he said something to her, but she never knew what he said. Oscar disappeared until a hundred years later when Lucy and her family (who are living in a city apartment) move to Iowa; Lucy looks at all the clues which are in Oscar's composition books. In the end, Lucy finds Oscar and they go on an adventure and all of the story beginnings in the book come true. I like this book because I like mysteries. If you love mysteries I think you should read this book. The endings of the chapters are in very wrong places because it always makes you want to read more! I think this book is a page turner. What do you think?